In her second book, The Things I Wish I’d Said, Michele Cozzens revisits a selection of previously published newspaper columns to offer observations on the same topics with a new perspective, contemplating the things she wishes she’d said. In this sometimes wry but always warm look at family life, The Things I Wish I’d Said reprints columns published in the early 1990s from her weekly Lifestyle feature in The Montclarion newspaper, where the criteria was everything had to be true and not too political. The author then responds to each piece with what she calls “a more mature eye and a bit mushier brain.” She responds first and foremost as a mother. 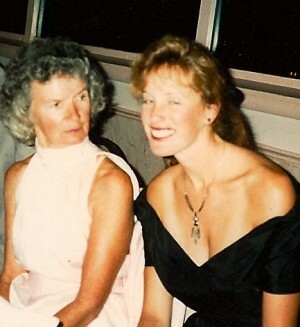 Michele and her mother, Kay, in 1989. The book was inspired by the death of her mother, and when Michele discovered an album her mother had kept of all her former newspaper columns. This former professional disc golfer (Frisbee golf) and Deadhead (Grateful Dead groupie) with Midwestern roots, explores light topics from baby showers, kids’ birthday parties and being an A-list volunteer, to home improvement and gardening, bad haircuts and blossoming out of an awkward youth. She also digs deep and shares intimate feelings about sexual harassment, the Disastrous First Marriage, and grief over the deaths of her mother and young niece, who suffered a fatal heart attack after taking the herb ephedra. After her niece’s death, the author donated proceeds from her book sales to the cause of herb awareness. Spreading information at a grassroots level, the organization HerBeware (“Just because it’s all natural, it doesn’t mean it’s safe”) applauds the FDA’s decision to ban ephedra. Michele VanOrt Cozzens is a talented writer with a broad range. You’ll laugh. You’ll cry. You’ll want to read more.